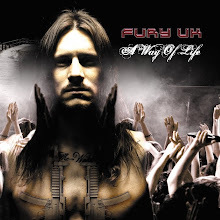 Update from Fury UK "HQ"
Hi everyone, just thought we'd give a little summary of what's going on from our "headquarters" & a reminder of what's to come! We're currently seeing out our end-of-year gig commitments which sounds a bit downbeat but the reality is far from that! The very next gig is a corker, this coming Saturday 29th Nov, at the Queen's Hall, Nuneaton with our great friends Beholder. Expecting a packed house there & can't wait, it's our debut at the venue & a great line-up. As well as our return to familiar territory at Bootleggers, Kendal on 4th December, we have a Blackpool weekend with a debut at the King Edward VII on 13th December, then we headline the Big Blackpool Toy Run charity event the following day at the Stanley. Awesome! Perhaps our biggest event in this end of year run, is the Dark Christmas event on 16th December, at the Music Box, Manchester, featuring also 3 other brilliant bands - Incassum, Seven Years Dead & Hellfighter. We think this is an ace line-up for £5 & we hope to see many of you there. It's a 14+ event. Tickets available from Ticketline or from each of the bands direct. Just before Xmas we then return to the Nag's Head, Macclesfield (19th Dec) & Whittles, Oldham (21st Dec), before finishing off our year with the festive spirit on Boxing Day at the Brewery Tap, Bradford & our now traditional visit to Hark To Towler, Bury between Xmas & New Year (27th Dec). We have to admit our minds are turning very quickly towards the recording of our new album & we start recording immediately after the Xmas/New Year break. We're looking for something very special with this next record & the writing of all songs is virtually complete, just a few arrangements to put the finishing touches to & we're ready to roll. We have a clear concept for the new album - expect heaviness, progressive influences, space & we continue also our taste for light & dark as there are undoubtedly some quieter moments in between the mayhem! We're taking January & virtually all of February off the road to work on the album & get a bit of rest then hit the gigs again big time after that. 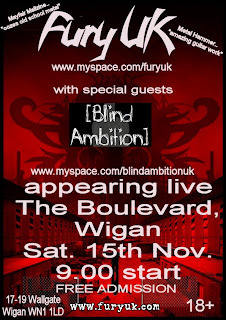 Look at the gig schedule at www.furyuk.com & you'll get the picture. More details to come soon. That's it for now. More to come very soon & hope to see you out there on the road during these next few weeks! 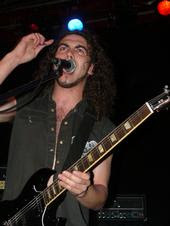 "FuryUK, who should really be called ‘The Chris Appleton’ experience - Chris is an exceptional guitarist who could easily give the Dragonforce guys a run for their money with his elegant Satriani-esque riffing, but when he’s the lead vocalist as well it just unfair to the other two guys." Details confirmed for this event with what we think features some of the very best Manchester bands around. We're bloody chuffed to be playing alongside these guys & reckon it'll be a cracking night. Tickets to be available via Ticketline soon & also from the bands. Last Wednesday it was the Helloween Ball. This was an awesome night with bands such as: Babylon Fire, Decadenze, Liquid Theory, & Code Zero. Each band was pretty awesome, with their own style - Babylon Fire had a very Heavy Metallica theme, & Liquid Theory were Progressive Metal a bit like Dream Theater/Megadeth. All cool! This night was fancy dress night so we had lots of weird & wonderful zombies, ghosts, werewolves & witches roaming around the venue. It was interesting to play a set in front of this crowd! We were visited by a lot of friendly faces that we've met before - DJ Moonlight from JFL Radio, who was dressed impressively as a witch, accompanied by Uncle Fester from Adams Family.It was also Moonlight's birthday so pretty cool she decided to spend the evening with us. Also we had good friends all the way from Oswestry - thanks Carol, Nigel & Dan. A great gig and the crowd was 200+ which made for a cracking atmosphere, & each band got a great reception. After the show we all were pretty tired, sweating and unhealthy, much needing a drink. Unfortunately we the bar was closed by this time so we couldn't cool off quite as well as usual. The van was a little unhealthy on the way home shall we say?!! The finale to the night was when we were packing the gear away & Rick from Babylon Fire managed to get stuck in the lift. It was pretty funny unless you're Rick of course :). The venue called the Fire brigade which as well as rescuing Rick seemed to keep our Fury UK merch girls quite happy. All in a nights work around here eh?!! Thanks a lot to everyone who turned out to this one. It was everything we'd hoped for with the fancy dress, atmosphere, friends & fun. Cool stuff!